Bicyclists and motorists share the roadways and need to commute in harmony. In order to do this and help avoid accidents, they must know — and obey — the rules of the road. This is the point that Grand Rapids city leaders hope to get across loud and clear, with a new $600,000 bike safety education campaign. The “Driving Change” camp aign will be in the face of Grand Rapids residents and visitors during the next several months. The city will be filled with billboards, television commercials, and ads on buses that emphasize the rules of the road for bicyclists and motorists, and the fact that these segments of the population must work together to stay safe. The campaign also includes social media posts and radio messages, like this one, informing cyclists and motorists of the laws they need to follow. In recent years, Grand Rapids has evolved into a bicycle-friendly community, creating more than 75 miles of bike lanes and enacting ordinances that help promote bicycle safety, including Michigan’s first “safe passing law.” Michigan is one of few states that does not have a statewide law requiring motorists to maintain a distance of at least 3 feet between their vehicle and a bicycle, when passing a cyclist. 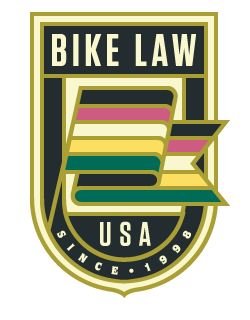 According to Sinas Dramis attorney Bryan Waldman, who specializes in bicycle law and is an avid cyclist himself, having a bicycle infrastructure and laws that recognize a cyclist’s right to use the roads does nothing to promote safety unless people understand and follow the laws. “It is for this reason that the City of Grand Rapids should be commended for its investment in this campaign and in its bike-friendly atmosphere,” he said. • Motorists must leave 5 feet when passing a bicyclist. • Motorists must watch out for bicycles, especially when turning right. • Motorists must not open vehicle doors in a manner that blocks bicycles. • Motorists must not park in a bike lane. • Motorists must not drive in a bike lane. • Bicyclists must obey all traffic signals and signs. • Bicyclists must be visible by using lights and reflectors. • Bicyclists must use signal turns. • Bicyclists should ride in the direction of traffic. • Bicyclists must be predictable. Ride in a straight line — do not swerve. The “Drivin g Change” message goes full throttle throughout May, which is National Bike Month, and will be ramped up again in July. A survey was conducted prior to the campaign, to gauge the public’s understanding of motorist-cyclist interaction and how the city’s bike lanes are supposed to work. A post-campaign survey will then be conducted, to see if it the message was successful. Statistics on bicycle-vehicle collisions will also be used to measure the campaign’s effectiveness. In 2014, Grand Rapids had 71 bicycle-vehicle traffic crashes — a decrease of 26 percent from the average of the prior 10 years. Suzanne Schulz, the city’s managing director of design, development and community engagement, said she wants the Grand Rapids campaign to be a model for the state of Michigan, as well as the nation. “We know that if people understand the rules they do believe there can be harmony, that we can get along on the road and make a safer city,” she said. Grand Rapids plans to continue its bike-friendly attitude, recently proposing $75,000 for bike lanes in its 2016-17 city budget and asking for a $27 million federal grant to fund various road projects, including cycle tracks on Lyon Street and Ionia Avenue.